At the General Audience of Wednesday, 25 October, the Holy Father returned to his catechesis on the Blessed Virgin Mary and her participation in her Son's saving work. "Mary is our Mother: this consoling truth, offered to us ever more clearly and profoundly by the love and faith of the Church, has sustained and sustains the spiritual life of us all, and encourages us, even in suffering, to have faith and hope". Here is a translation of the Pope's address, which was given in Italian and was the third in the series on the Blessed Virgin. 1. Saying that "the Virgin Mary ... is acknowledged and honoured as being truly the Mother of God and of the Redeemer" (Lumen gentium, n. 53), the Council draws attention to the link between Mary's motherhood and Redemption. After becoming aware of the maternal role of Mary, who was venerated in the teaching and worship of the first centuries as the virginal Mother of Jesus Christ and therefore as the Mother of God, in the Middle Ages the Church's piety and theological reflection brought to light her co-operation in the Saviour's work. This delay is explained by the fact that the efforts of the Church Fathers and of the early Ecumenical Councils, focused as they were on Christ's identity, necessarily left other aspects of dogma aside. Only gradually could the revealed truth be unfolded in all its richness. Down the centuries, Mariology would always take its direction from Christology. The divine motherhood of Mary was itself proclaimed at the Council of Ephesus primarily to affirm the oneness of Christ's person. Similarly, there was a deeper understanding of Mary's presence in salvation history. 2. At the end of the second century, St Irenaeus, a disciple of Polycarp, already pointed out Mary's contribution to the work of salvation. He understood the value of Mary's consent at the time of the Annunciation, recognizing in the Virgin of Nazareth's obedience to and faith in the angel's message the perfect antithesis of Eve's disobedience and disbelief, with a beneficial effect on humanity's destiny. In fact, just as Eve caused death, so Mary, with her "yes", became "a cause of salvation" for herself and for all mankind (cf. Adv. Haer., III, 22, 4; SC 211, 441). But this affirmation was not developed in a consistent and systematic way by the other Fathers of the Church. Instead, this doctrine was systematically worked out for the first time at the end of the 10th century in the Life of Mary by a Byzantine monk, John the Geometer. Here Mary is united to Christ in the whole work of Redemption, sharing, according to God's plan, in the Cross and suffering for our salvation. She remained united to the Son "in every deed, attitude and wish" (cf. Life of Mary, Bol. 196, f. 122 v.). Mary's association with Jesus' saving work came about through her Mother's love, a love inspired by grace, which conferred a higher power on it: love freed of passion proves to be the most compassionate (cf. ibid., Bol. 196, f. 123 v.). 3. In the West St Bernard, who died in 1153, turns to Mary and comments on the presentation of Jesus in the temple: "Offer your Son, sacrosanct Virgin, and present the fruit of your womb to the Lord. For our reconciliation with all, offer the heavenly victim pleasing to God" (Serm. 3 in Purif., 2: PL 183, 370). A disciple and friend of St Bernard, Arnold of Chartres, shed light particularly on Mary's offering in the sacrifice of Calvary. 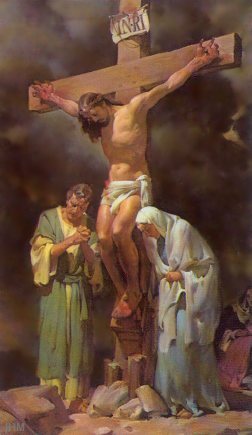 He distinguished in the Cross "two altars: one in Mary's heart, the other in Christ's body. Christ sacrificed his flesh, Mary her soul". Mary sacrificed herself spiritually in deep communion with Christ, and implored the world's salvation: "What the mother asks, the Son approves and the Father grants" (cf. De septem verbis Domini in cruce, 3: PL 189, 1694). From this age on other authors explain the doctrine of Mary's special cooperation in the redemptive sacrifice. 4. At the same time, in Christian worship and piety contemplative reflection on Mary's "compassion" developed, poignantly depicted in images of the Pietà. Mary's sharing in the drama of the Cross makes this event more deeply human and helps the faithful to enter into the mystery: the Mother's compassion more clearly reveals the Passion of the Son. By sharing in Christ's redemptive work, Mary's spiritual and universal motherhood is also recognized. In the East, John the Geometer told Mary: "You are our mother". Giving Mary thanks "for the sorrow and suffering she bore for us", he sheds light on her maternal affection and motherly regard for all those who receive salvation (cf. Farewell Discourse on the Dormition of Our Most Glorious Lady, Mother of God, in A. Wenger, L'Assomption de la Très Sainte Vierge dans la tradition byzantine, p. 407). In the West too, the doctrine of the spiritual motherhood developed with St Anselm, who asserted: "You are the mother ... of reconciliation and the reconciled, the mother of salvation and the saved" (cf. Oratio 52, 8: PL 158, 957 A). Mary does not cease to be venerated as the Mother of God, but the fact that she is our Mother gives her divine motherhood a new aspect that opens within us the way to a more intimate communion with her. 5. Mary's motherhood in our regard does not only consist of an affective bond: because of her merits and her intercession she contributes effectively to our spiritual birth and to the development of the life of grace within us. This is why Mary is called "Mother of grace" and "Mother of life". The title "Mother of life", already employed by St Gregory of Nyssa, was explained as follows by Bl. Guerric of Igny, who died in 1157: "She is the Mother of the Life from whom all men take life: in giving birth to this life herself, she has somehow given rebirth to all those who have lived it. Only one was begotten, but we have all been reborn" (In Assumpt. I, 2: PL 185, 188). A 13th-century text, the Mariale, used a vivid image in attributing this rebirth to the "painful travail" of Cavalry, by which "she became the spiritual mother of the whole human race". Indeed, "in her chaste womb she conceived by compassion the children of the Church" (Q. 29, par. 3). 6. The Second Vatican Council, after stating that Mary "in a wholly singular way co-operated in the work of the Saviour", concludes: "for this reason she is a mother to us in the order of grace" (Lumen gentium, n. 61), thus confirming the Church's perception that Mary is at the side of her Son as the spiritual Mother of all humanity. Mary is our Mother: this consoling truth, offered to us ever more clearly and profoundly by the love and faith of the Church, has sustained and sustains the spiritual life of us all, and encourages us, even in suffering, to have faith and hope.